The Cubs have a special place in my heart. Growing up as a fan of a losing team that wears red and blue, I can’t help but have sympathy for the fans that have waited 100 seasons for a championship. 2009 will make it 101. 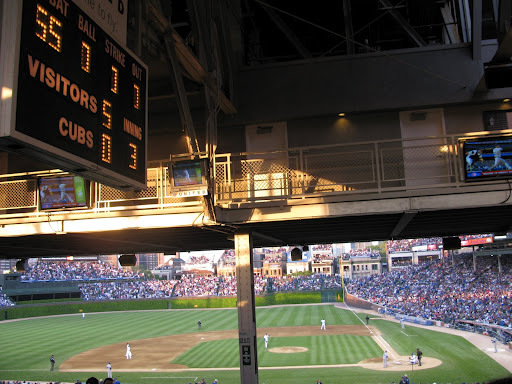 Still, Wrigley Field is an institution. It’s exploded beyond the stadium. There are bleachers on nearby rooftops. The entire neighborhood is named Wrigleyville. As we get off the El, I can’t help but be a little jealous that Chicago seems to love its team more than Philly does. They sell t-shirts declaiming their hatred for every team in their division. They even mock fans of the White Sox, their neighbors to the South and not technically competitors. We have two extra tickets we are trying to unload, and there are more scalpers than potential ticket buyers. Why pay for a ticket inside the stadium when you can peak in on the action from a gate in right field? We wander around aimlessly, feeling like foreigners. I unzip my sweatshirt so my blue sweater can be revealed. I’m trying to belong to a culture bigger than the team’s history. Inside the stadium, our seats give us a picture different than the one I was expecting. We see just the bottom sliver of the jumbotron, but have flat screens showing ESPN. We can’t see the upper decks, but we do have a view of the doorways to the box seats, and the dessert carts and coffee service to entertain them. Wrigley strikes a nice balance of required activities and cheers. There isn’t too much to shout or dance or guess in a trivia game. 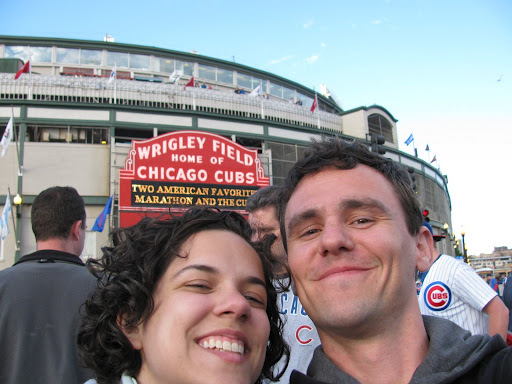 “Let’s Go Cubbies” happens organically. Though with this game it’s hard to feel enthused. The Cubs behave just how we would have predicted. Poorly. There’s no hustle. Balls are bobbled. Men stay stranded on base after base. The Dodgers are allowed to score 5 runs on the 1st inning, while the Cubs let their pitcher who permits this disaster to stay in the game. When they finally take him out a few innings later, he is booed. At least this town knows when they don’t have a winner and they let you know it. Cubs fans are just as self-depricating as Phillies fans. The guys behind us can’t stop talking about how a pole obstructs their view of 2 or 3 or 4 players, depending on if a righty or lefty is up to bat. They paid alot for these tickets! As one says “If I paid this much in Milwaukee, I could get in the dugout.” His friend responds, “Yeah, pay $125 and you can bat 8th for the Brewers.” A third chimes in, “Then I’d be batting clean-up.” This sense of humor gets us through the to the bottom of the 6th, when the score is 8-0 Dodgers. These are Dodgers without Manny Ramirez. The team we thought was a one man show, not really a team. Even the Cubs can’t let this go unanswered. In the bottom of the 6th, they manage 2 runs. Of course they leave even more stranded. The ballboys still run with vigor. And the pitchers still hit batters in retaliation for near misses on their own teammates. Pitching changes, pinch hitters. The team goes through the motions. But the fans have given up. The top of the 8th, and they are walking out. There are two more at bats for the Cubs. Don’t they know baseball? Anything can happen. Haven’t they learned in 100 years that not everything losing game turns into a loss? We stay planted in our seats. As Phillies fans, we know what is possible. The Cubs fans know better. Nothing happens in the last 2 innings. No one scores for either side and this goes down as an 8-2 loss. What’s another one? Why bother to watch when Wrigleyville awaits? I love that you're blogging this trip! How cool! !